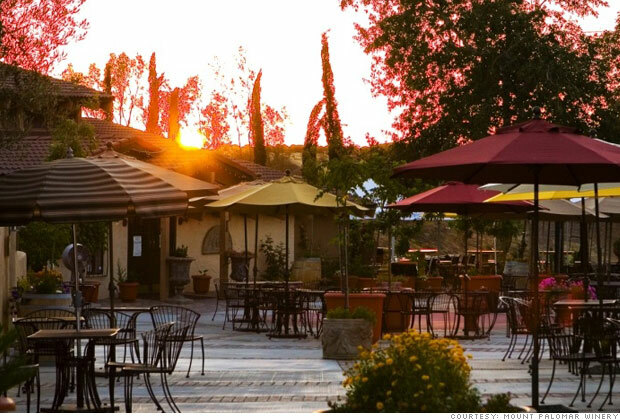 Where to visit: Temecula, Calif.
Spring is a great time to go wine tasting, and a tour doesn't have to mean a trip to northern California. In fact, there are great wineries dotted throughout North America. Beyond northern California's Napa Valley, the Temecula Valley -- 45 minutes north of San Diego and an hour from Orange County -- has been quietly growing wine grapes and making wine since the 1960s. Wine-related tourism here sprung up only recently. ''After 40 years, this area has it figured out,'' said winemaker Craig Boyd. Boyd got his oenology start in the Sierra Foothills region east of Sacramento. ''It's a beautiful part of the world here,'' he said. A favorite at Mount Palomar is Solera Cream Cherry, a wine that's been in production for 30 years and ''has won a pile of medals,'' said Boyd. Mount Palomar is a pioneer within California when it comes to planting Italian-wine grape varietals like Sangiovese and Cortese. Only 15 acres are planted in the United States, and three of those acres are planted at the winery.